What are the TOP 50 Brands on Facebook ? Ignite Social Media recently announced this year’s winners of their annual ranking of the top fifty branded business Facebook fan pages. The top five brands of 2009 remain the top five brands of 2010, in the same order no less! But the results did uncover some surprising findings. 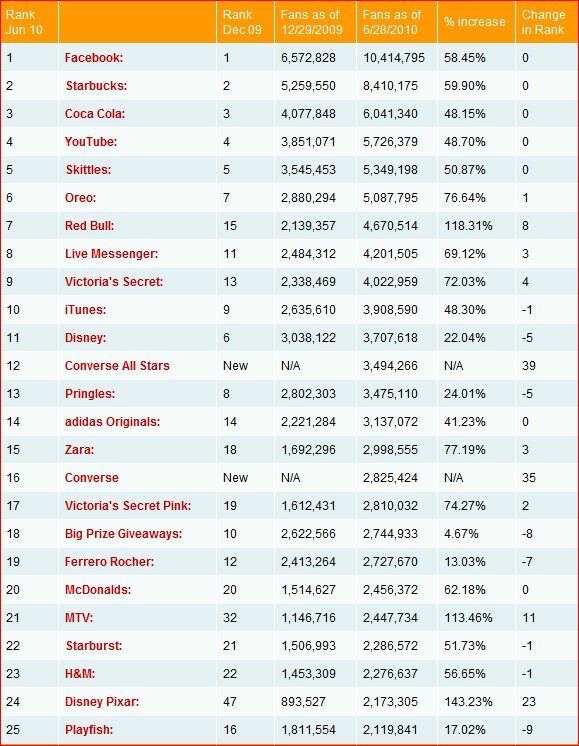 Apple Students disappeared as a fan page in the last six months, eliminating the twenty-fourth largest fan page. Disney Pixar’s fan page grew 143.23% in that same time frame. New entrants as Converse, Playstation and Xbox. Full list (#50) of winners plus oodles of trends at Ignite Social Media.